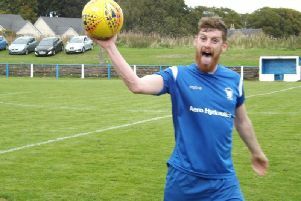 Lanark United remain firmly in the promotion hunt after recording a fourth league win in their last five matches against St Anthony’s. United’s 4-2 home success at Moor Park last Saturday puts them in third place with 25 points from 15 matches in McBookie.com Central Division 2. The match saw United end a terrible recent penalty record – which had seen them miss their last five from the spot – when Paul Burns scored in the first half. United manager John Brogan later praised left back Burns, a recent signing from Larkhall Thistle. “It was very pleasing that Paul was able to score from the spot,” said Brogan. “He is a good pro who has given us a calming influence in the four games he’s played for us. “We have been doing all right recently with four wins in five. There are a lot of young boys in the side so I’m pleased with that. They are beginning to know each other. “Gareth Halford the goalkeeper has been outstanding and he brings a lot of confidence. Despite ultimately emerging with the three points against St Anthony’s, Lanark were shocked when The Ants took the lead after only three minutes. A right wing free-kick was headed into the net by Kieron Maxwell to put the seventh placed visitors 1-0 up. But United levelled on 15 minutes when Paul Burns netted from the penalty spot after David O’Donnell was fouled inside the box. And David O’Donnell then gave United the lead on 25 minutes with a great run and finish with a rising left foot shot. On 53 minutes Peter O’Donnell collected on the left and his pass inside found Ronan Kearney who scored with a low shot across goal and into the net at the back post to give United a two goal lead. But Ants responded and reduced the leeway on 66 minutes when Anton Conway ran onto a loose ball and scored with a low drive. However, United went on to clinch the three points on 73 minutes following a left wing corner when the ball broke to Cammy Lawson and he fired home a low right foot shot. Brogan added: “We showed a lot of character to come back after losing the early goal.